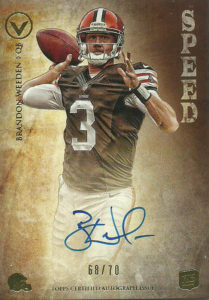 Brandon Weeden. What an interesting road it has been for him, and so, a fortuitous one for him and the Houston Texans. Weeds took a different approach to the NFL, as he was a baseball player first that was drafted in the second round of the 2002 MLB Amateur Draft by the Yankees. He pitched in the minor leagues with them, then later the Dodgers, the Royals, and after the 2006 season quit the sport all together to focus on football, enrolling at Oklahoma State where he was a 2 year starter. He posted some impressive numbers, and set school single game and season records for the Cowboys. He’d become the oldest player selected in the first round (28), by the Cleveland Browns in 2012. The Browns have been a cesspool for quarterbacks since they returned to the NFL. He’d beat out Colt McCoy for the starting job and after a rough start posted a club rookie record 3,385 yards passing- nevermind his 14 to 17 TD to INT ratio or his 5-10 record. The winds of Cleveland blew fiercely and the 3rd new head coach in 4 years (Rob Chudzinski) was not impressed by Weeds. After 5 ineffective starts, Brandon was unceremoniously benched for Brian Hoyer. Although Brandon was on pace to improve in only his second season as a starter in the NFL, it was obvious his time was short with the Browns. During that season with Cleveland, Brandon threw a 95 yard TD to lead the NFL. It was a new world in 2014 for Brandon. Considered a part of Pat Shurmur or Rob Chudzinski’s aborted regimes, new head coach Mike Pettine cleared house. Weeds signed with the Dallas Cowboys to compete with Kyle Orton for the backup job behind oft injured Tony Romo. Beating out Orton in camp, Weeden saw some limited playing time during his first season with the team. The Cowboys considered him a lucrative insurance policy for Romo. The wheels fell off the Cowboys in 2015. With a season ending injury to Tony, Brandon assumed the role as the starting quarterback during week 2. After posting a 0-3 record as starter for the Cowboys, Brandon quickly found himself on the outside looking in, when Matt Cassel replaced him in the lineup- largely to the same results. It must have been difficult for Weeds, as the coaches and ownership paid him plenty of lip service both in the clubhouse and in public- nonetheless, he was cut in mid-November. The Texans have had a hard time keeping a quarterback upright for a full 16 game slate going back to 2012 (Matt Schaub). 2015 was no different. Ironically former Brown Brian Hoyer won the job in camp fighting off the imploding Ryan Mallett. The legend TJ Yates returned after the team had enough of Mallett, but after Hoyer was placed in concussion limbo, the team scrambled to find a backup for Yates. Enter: Brandon Weeden. I remember when the Texans signed Brandon the following day after being cut by the Cowboys. Honestly, I was terrified. He was a heartbeat away from being the Texans starting quarterback if Yates was injured. Houston controlled their own destiny to winning the division but was involved in a dogfight with the Colts. It’d be in that game, in Week 15 against the Colts at Indianapolis- a place that the Texans had never won, that Weeden would finally come alive. With Yates tearing his ACL early in the game, Weeden came in and deftly executed the offense. He went 11 of 18 and threw for a TD to Jalen Strong early in the 4th quarter. The Texans, won 16-10 and took the driver’s seat for the division that the Colts had held nearly all season. The following week the Texans dominated the hapless Titans 35-6. Weeds threw for 200 yards on 15 of 24 passing, including 2 passing TDs and a rushing TD. While he’d return to the bench the following week as Hoyer finally cleared the concussion protocol, Brandon Weeden cleared his little place in Texans lore that season- and earned a fair amount of respect from me. Brandon in 2016 did not see any playing time behind the erratic Brock Osweiler or Tom Savage. He’d be among the Texans final cuts before the season began in 2017 as many teams were only electing to keep 2 quarterbacks on their roster. A few weeks later he’d find a home and join the Tennessee Titans.